Generally I side with installers when there are issues. But lately, the rash of calls I have been receiving on installers not taking the time to do things correctly, I have to re-think my stance. There is nothing more frustrating than when your asked to provide training and you show the installers the correct way to do something and then you visit a jobsite later that day and they are still doing it the way they want to which is not recommended. Below are the hottest issues I have been receiving on a regular basis over the last month. Urethane Adhesive Residue spots on hardwood. This one I have been getting 2 to 3 calls a week on. This is just lack of proper clean up. I have been seeing lots of smearing of the Urethane Adhesive which tells me the installers are not changing their cleaning cloths. They keep using the same cloth and they are basically cleaning up the Urethane Adhesive residue and putting it back on the floor further down the line. For this reason, I have been pushing the Modified Silane Adhesives for Hardwood and glue down Laminate. They trowel nicely and the residue cleans off very easy if left on for weeks. Residential Sheet Seams opening up. After digging into this a little further, I found out the installers are Straight Edge and Butting the sheet floor seams. 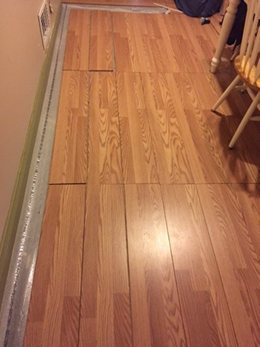 This practice left the industry many years ago, but yet installers continue this practice (with lack of success) with the newer flooring products. There is not a residential sheet floor on the market today that I know of that recommends Straight Edge and Butting the sheet floor seams. Everything today and the last 10 plus years has been Double Cutting of the seams. If you are Straight Edge and Butting seams and there is a gap in the seam, it is going to open. It is like a zipper; once it starts to open it does not stop and the topical seam coater is not to be used as a seam filler. Lack of Expansion on Floating Floors. Whether it is Laminate, Floating Hardwood, Floating LVP or Sheet floors, if it floats it needs expansion space. It only takes one small piece of flooring fitted to tight to a vertical object to cause a major buckle and a flooring failure. I have looked at jobs and one piece is a 1/4ʺ away from the wall and the next piece is tight to the wall. Every inch of these floors needs to be cut away from any vertical object or it is going to fail. The other note with a floating floor is you cannot install cabinets on top of the floating flooring. I get this call a few times a year from a flooring contractor who has a customer that wants a floating floor and wants to install it and then have the kitchen cabinets installed on top of the floating floor. My response; “do they a want a warranty or not.” Not recommended! Troweling of “All In One Hardwood Adhesives.” When using “All In One Hardwood Adhesives” as a moisture barrier, it is recommended to rake the adhesive perpendicular to the installation of the hardwood. This way you are reducing the chances of leaving voids or not applying enough adhesive in the adhesive for moisture to get to the Hardwood. You are not to swirl the “All In One Hardwood Adhesives” in a serpentine pattern as this increases the chances for voids left in the adhesive. The other note here is to work off of these adhesives when using them as an “All In One Hardwood Adhesives” or you can cause hollow spots. If you need to work on the Hardwood, use a kneeling board to disperse your weight. I was asked to help provide training for the “All In One Hardwood Adhesives” down in South Carolina by a large contractor. We worked with the installers for a few hours explaining how to trowel the adhesive and not to work on the hardwood. We stopped by the jobsite the next day and the installers were swirling the adhesive and working on the hardwood without a kneeling board. Heat Welded Seams pulling apart. I get this one quite frequently. This is generally not having the welding gun hot enough and they are not melting/fusing the weld rod into the vinyl. There is very little strength at the seam and then the seam starts to separate. Another factor to the seams pulling apart can be how the seams were cut. Seams for heat welding are to be edge trimmed then recessed scribed. Many installers are just pulling the material off the roll and gapping the seams the thickness of a knife blade. 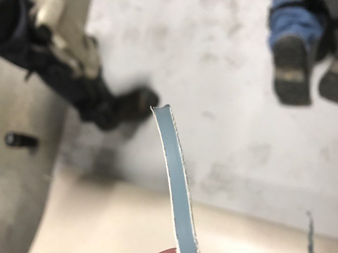 Having a seam with an inconsistent gap can put stress on the seam as you are requiring the heat weld bead to span larger areas and keep the seam together. The picture on the following page shows that the weld rod melted consistently into the vinyl sheet flooring. The worst thing an installer can say to me on a failed installation is; “I have been doing it this way for 30 years.” My response back is, “you have been doing wrong for the last 20 and we have a lot of work to do with you”. I just had to share the previous photo of a Laminate installation that was done professionally. The Laminate Floor was pin nailed in every corner and most of it was tongue to tongue and groove to groove. Some installer actually did this and tried to accept money for this mess. Thanks to an old friend, Greg Wise for sharing. The key element of success with training installers is a qualified instructor who has the personality and demeanor to earn the trust and respect of the flooring professional. Tim McAdoo has a vast array of knowledge and highly developed installation skills and qualifications that have been amassed over his 35 years in the floor covering industry which has covered manufacturing, product development, installation and installation training. Tim is a certified instructor for Armstrong and Bruce flooring products. While a member of the Armstrong Installation Training Team since 1984, Tim is privy to all the latest innovations and techniques used in the installation of their products. We are sure you will find your skills will be honed and improved after attending one of his programs.